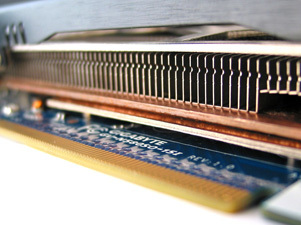 In terms of the display outputs on the back of the card, GIGABYTE's GTX 580 SOC maintains the same set of connectors as NVIDIA's reference GTX 580. These include a pair of dual-link DVI outputs along with a mini-HDMI (version 1.4a) output header. Unfortunately bitstreaming support for both Dolby True HD and DTS-HD Master Audio over HDMI is not present unlike GTX 560 and lower GPU variants. 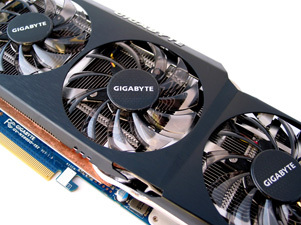 A unique technology featured on GIGABYTE's motherboards has come to graphics cards in the form of the Ultra Durable VGA Plus+ technology banner. 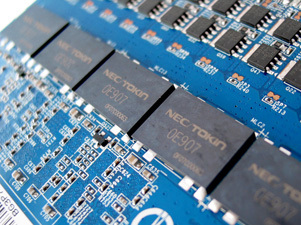 This includes a 2oz copper design for a lower working temperature and a reduction of hotspots, better overclocking and better power efficiency, as well as Japanese solid capacitors, Tier 1 memory from Samsung and Hynix, NEC Proadlizers also known as film capacitors, that provide extra current capacity and low ESL/ESR, as well as quality Ferrite Core chokes and MOSFETs adding to the benefits of the 2oz copper design. 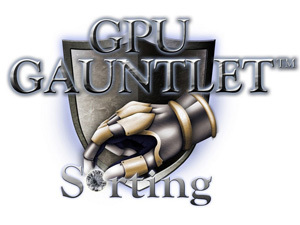 Combine this upgraded circuitry with their GPU GAUNTLET sorting program that focuses on cherry picking GPU's that offer the highest power efficiency, lowest power consumption and overclocking potential, you end with a card that runs cooler and uses less power than a comparable reference design, especially when overclocking and pushing higher voltages. 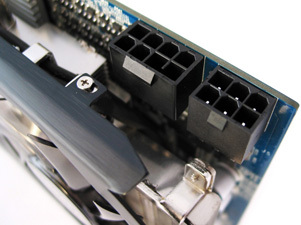 On the edge of the card we find a set of SLI connectors, and unlike mainstream video cards like the GTX 560, the GTX 580 allows 3-way SLI and up to 4-way SLI with supporting motherboards, just like we find on NVIDIA's reference design. 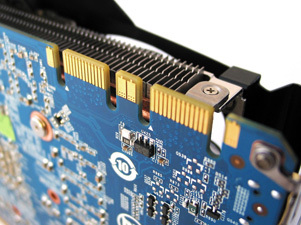 On the other end of the card we have a pair of PCI-Express power connectors, one 6-pin and 8-pin, which is a standard offering for performance/enthusiast level of a video card, and in-line with NVIDIA's reference design. As first seen in the previous GTX 480 SOC, GIGABYTE have included a Dual BIOS switch that contains two different BIOS chips, and not just a backup of the original BIOS. By default the button is illuminated blue letting you know the default Super Overclock BIOS is active. 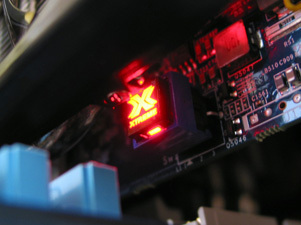 Pressing the button changes the illumination to red, enabling the LN2 BIOS that is specially designed for overclockers to avoid potential cold bug issues at extremely low temperatures. 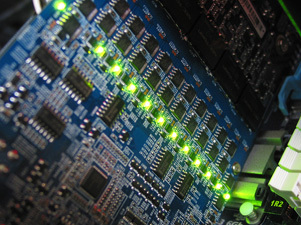 On the back side of the card we find a busy array of power delivery components, lined with twelve green LEDs each representing one of the twelve power phases for the GPU's power delivery system. The card itself has a total of fourteen power phases, twelve for the GPU itself and the remaining two for the memory. Once the OC Guru software is installed, the card automatically powers down each phase when idle and increases the phase count while gaming. 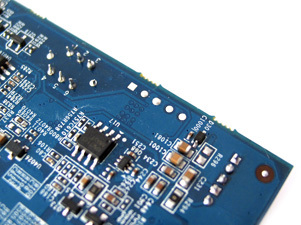 This activity can be seen as the array of LEDs turns off and on. 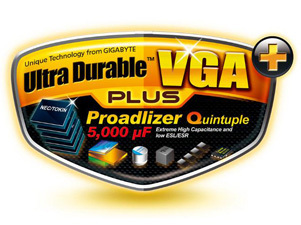 Part of the Ultra Durable VGA Plus+ implementation is a row of five NEC/Tokin Proadlizer film capacitors (Model: 0E907). 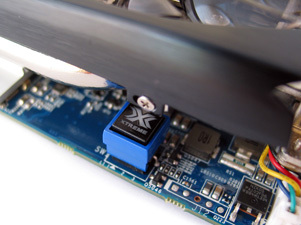 The capacitors are rated at 2.5v and 900uF and are used to provide a higher current capacity, higher switching frequency and excellent electrical noise absorption properties especially when upping the voltages and clock speeds of the GPU and memory. In the second image, and on the opposite PCB side to where we find the Dual BIOS switch, we also find a set of five voltage read points for monitoring of the GPU-core, GPU-I/O, memory, PCI-E voltages, with the last being the ground. These can be especially helpful for extreme overclockers and voltage modifications. One of the most obvious ways that GIGABYTE's card differs from the original reference design, apart from the PCB and improved power circuitry, is the cooling system. The card sports GIGABYTE's own WINDFORCE X3 thermal cooling solution with a large 140mm x 86mm vapour chamber and dual heatipes to transfer the GPU's heat to an aluminium heatsink spanning the whole PCB, which is then cooled by three 80mm PWM controlled fans. Three-quarters of the cooling solution is a large vapour chamber with an aluminium fan array, about 14% larger than NVIDIA's original vapour chamber design. 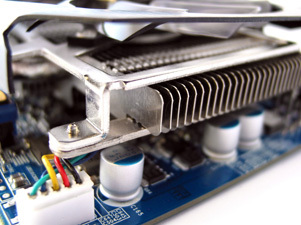 The last quarter of the card is linked to this vapour chamber by two large nickel plated heatpipes, further moving heat to a separate heatsink at the far end of the card, directly underneath the third cooling fan near the power connectors. Thankfully GIGABYTE have covered the MOSFETs under an aluminium heatsink that is cooled by the multiple WINDFORCE cooling fans to make sure the card is kept cool at all times, and reduce the chance of heat spots and components failing during long periods of load. 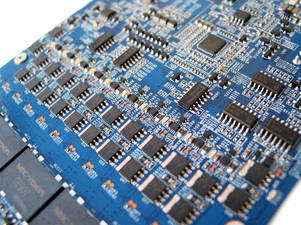 What hardware is complete without a good software package? 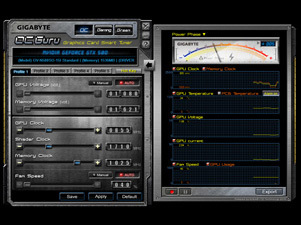 Thankfully GIGABYTE have included their own OC Guru software to complement the hardware implemented. OC Guru allows the adjustment of both GPU and memory voltages, as well as the usual clock speeds and fan control. Alongside these controls are three key profiles in the software: OC, Gaming and Green. The OC area provides complete access to all the overclocking adjustments, while the Gaming profile focuses itself on GPU and memory clocks, as well as display colour adjustments and a OSD (on screen display) for monitoring while in-game. 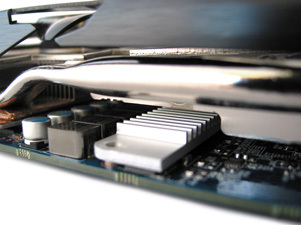 The third called "Green" is for those looking to reduce the power usage and clocks of the video card, similar to what can be found with their Dynamic Energy Saver software for motherboards.